Thyroid gland is one of the most important endocrine gland in the body. Until 17th century it was believed to have nothing more than the cosmetic role of making the neck more shapely. Thyroid hormones are very essential for normal metabolism growth and development. It is very sensitive and reacts to stress and stimuli very easily. So it is no wonder that thyroid disorders became the second most common endocrine disorder. Recent studies show that one out of 13 people are suffering with thyroid disorders and still more than half of the population is still unaware of it. Due to inadequate success in combating the problem with other systems of medicine there is increasing demand to treat the disease with Ayurvedic system of medicine. Many of the thyroid disorders are not life threatening and easily amicable to treatment. 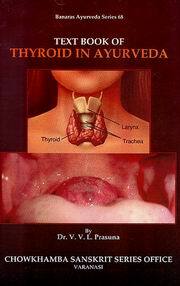 So it is attracting many Ayurvedic practitioners but the main obstacle is that there is no exact correlation of thyroid gland in Ayurveda and many Ayurvedic Practitioners are adopting a vague approach by simply prescribing Kanchanara Guggulu or call all the thyroid disorders as Galaganda which is giving successful results some times and sometimes not. Ayurvedic system of medicine is very futuristic and it has solutions even to the forthcoming disorders. Caraka emphasized that nomenclature of the diseases is not much necessary to treat the disease rather he insists on diagnosis of the constitutional status and plan the treatment accordingly. Approach to the thyroid gland is better understood by the actions of the thyroxine on the body rather than the anatomical location. The main action of thyroid hormone is to act as a spark to pep-up body metabolism. In ayurveda parlance it can be correlated with the actions of Agni. Understanding the disease and the constitutional status of the disease is very important for planning the treatment and applying the Ayurvedic treatment principles. For that the etiology clinical features and their types are mentioned here. An attempt has been made to elaborate the treatment principles about the thyroid disorders without distracting the basic philosophy and precincts of Ayurveda for almost all types of thyroid disorders. This book will surely beneficial to all the Ayurvedic practitioner’s students research persons and all those who are interested in science.